Fig. 1. Wet leaf/glossy and reduced epicuticular wax phenotypes exhibited by wsl mutant line KDS-2249D. 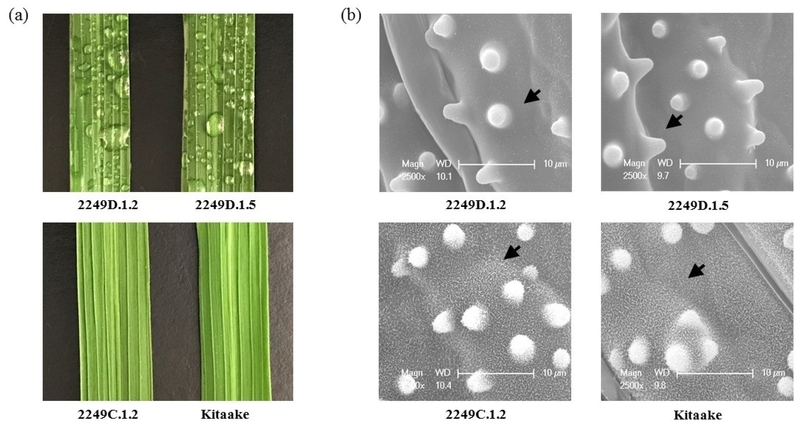 (a) KDS-2249D mutant lines (top panels) exhibit adhesion of water after misting resulting in a wet leaf/glossy appearance not observed in the KDS-2249C sister line or the wild-type Kitaake progenitor (bottom panels). (b) Corresponding SEM images of abaxial leaf surfaces (2,500× magnification) show the reduction in the density of epicuticular wax crystals (white, irregular-shaped projections) associated with the wsl mutants. Individual crystals indicated by black arrows. Large knob-like structures are papillae.